One of the colorful and desirable minerals from Tsumeb, a nice specimen of bright red Chalcotrichite. 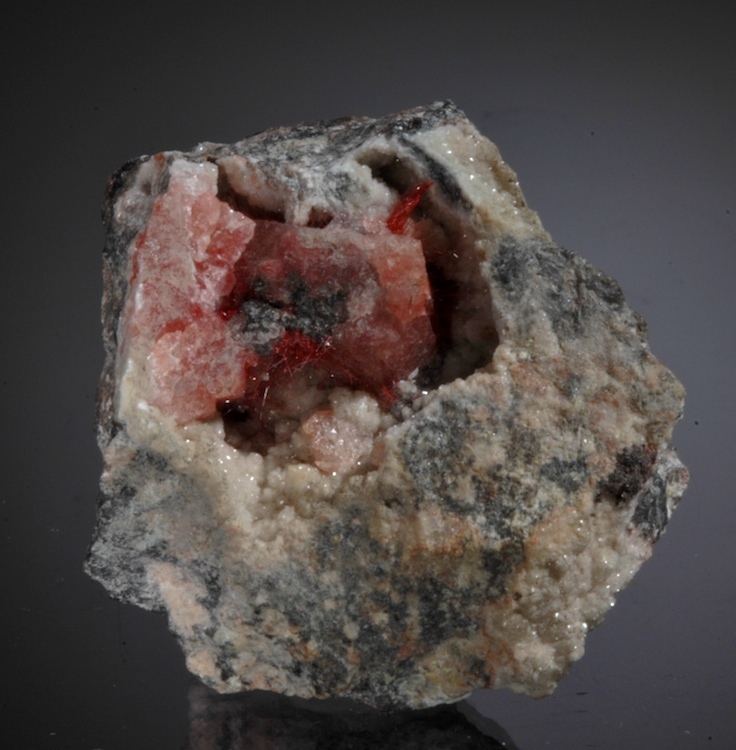 The specimen vug has several tufts of red hair crystals and a mass of Calcite that is bright red colored by included Chalcotrichite. 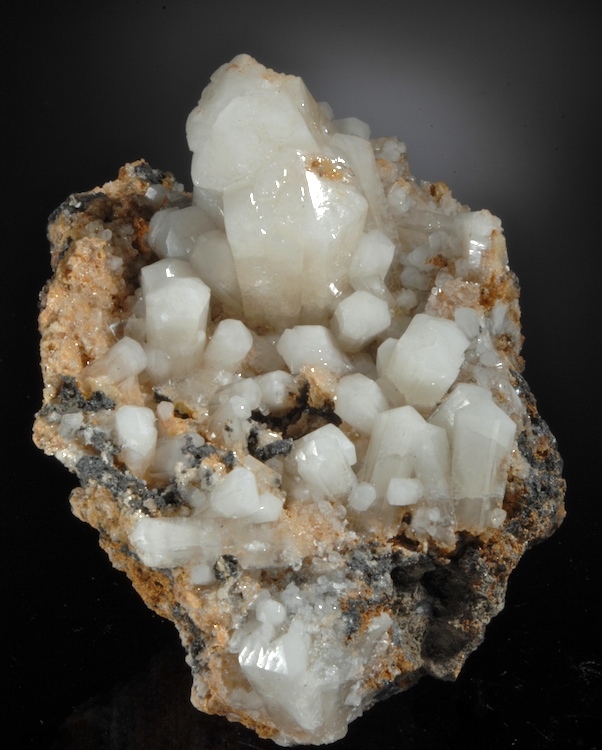 The cavity in this specimen is also lined with tiny Dolomite crystals and provides a good protection for the delicate crystals inside. 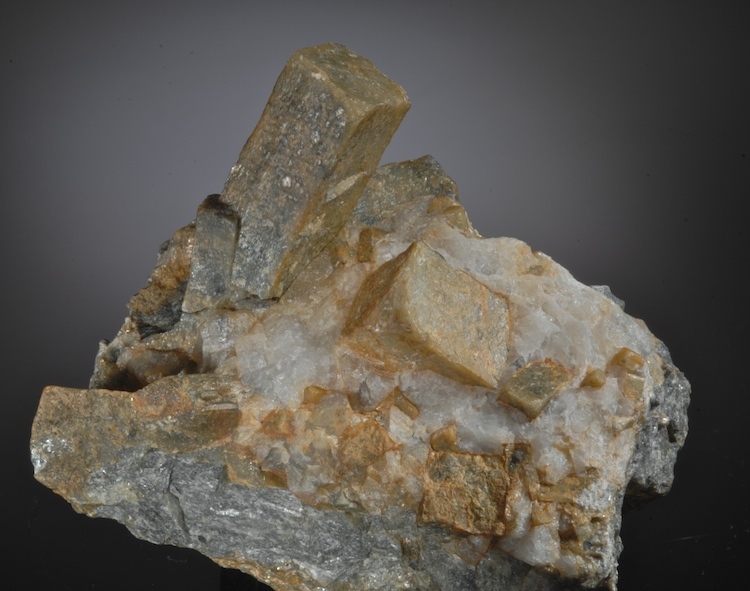 A classic Tyrolian Andalusite, several sharp crystals are well exposed from enclosing Quartz. These old Austrian specimens are some of the best examples of this specie, which is usually not very impressive. This is in fine condition and has strong esthetics. With several old labels, this is a about as sharp and perfect as these crystals get. 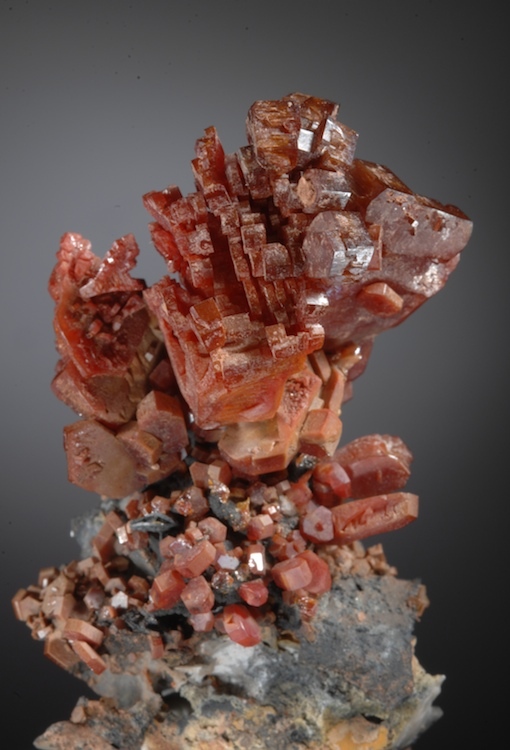 A complex cluster of deep red hoppered and elongated Vanadinite in epitaxial arrangements perched nicely on a base of Barite blades. An older Mibladen specimen, the branching, tree-like form makes it very eyecatching. Undamaged by naked eye but magnification does find some small chipped spots. An unusual piece that is quite elegant and well composed. Sharp purple Apatites are scattered on a finger of fine grained muscovite in an esthetic grouping. Crystals reach 1.7 CM and most show good color zoning. 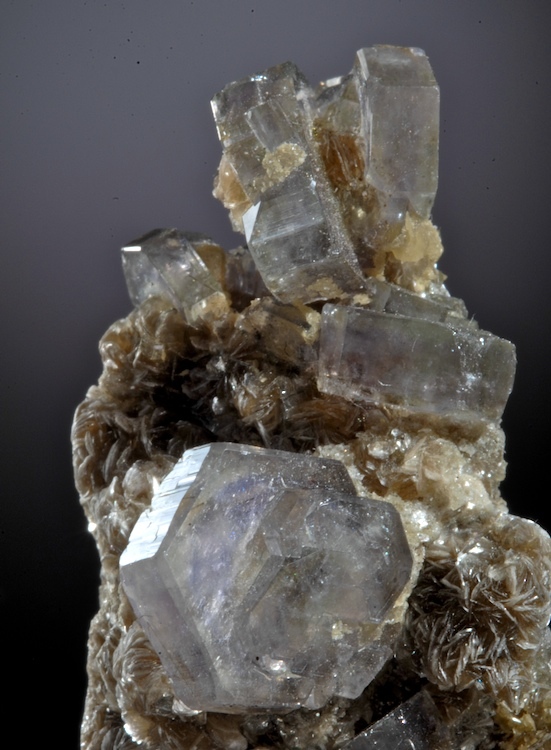 A choice small cabinet specimen that displays well from the classic mines of Panasquiera. One small contact can be found on a lower edge otherwise this is in perfect undamaged condition. Gersdorffite in good or sizable crystals has been super rare until this one small discovery. This is a very fine piece and is the best example we have had from the world class 2014 Bou Azzer find. Sharp lustrous octahedra in a cluster with contrasting green Annabergite shows this Nickel specie well. A brittle mineral, this has some cracks and chipping on some crystals but overall is in exceptional condition. Sharp crystals to 2.3 CM is quite impressive for this specie. 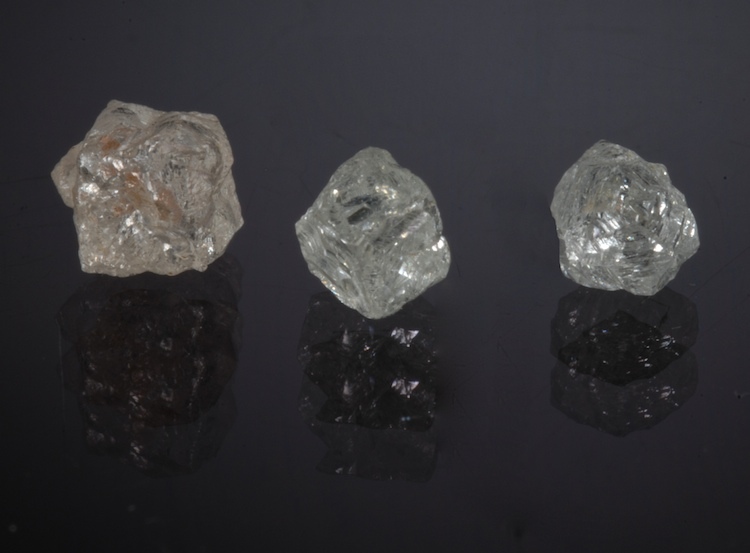 A group of three Diamond crystals, each with a slightly different color hue and very different crystal habits. From an old collection, these total 1.55 Carats. The largest crystal is a penetration twin cube the middle size is a cube with half of its faces having hopped indents and half with growth hillocks and the thirst seems like a cyclic discoidal twin. Under magnification many small modifications and extra faces are seen. Sharp and a nice suite of Carbon! 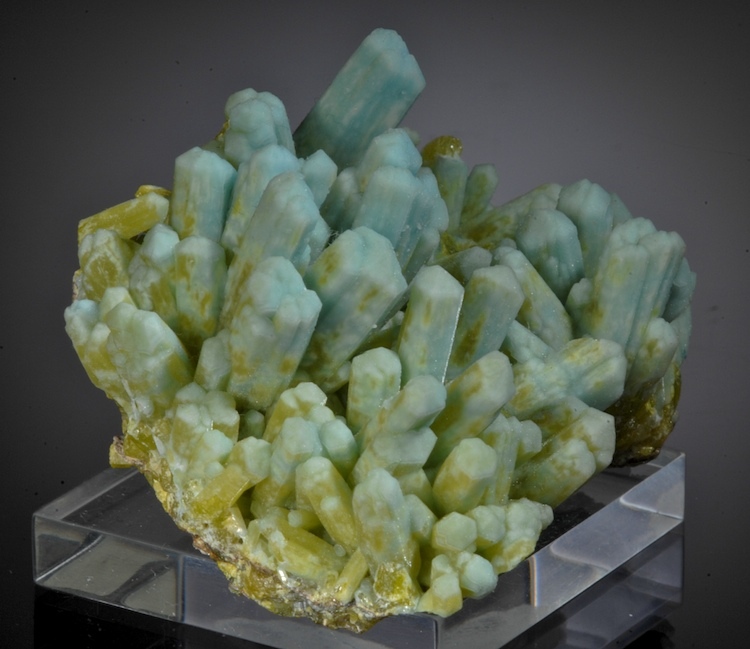 The Daoping mine is famed for Pyromorphites, among the worlds best, but new discoveries of Pumbogummite are by far the best on the planet. This specimen has fine form, great color and display impact, it is far above average for the mine and on its own just a beautiful specimen of a previously rare and expensive mineral. Nearly all of these have considerable damage, staining or crude areas. This one has a lot less damage than usual, the main crystals are complete and perfect, and the color is a killer bright blue. Damage limited to outer edge and two other spots. A choice display piece that is a modern classic and stands out from the typical specimens of this find. 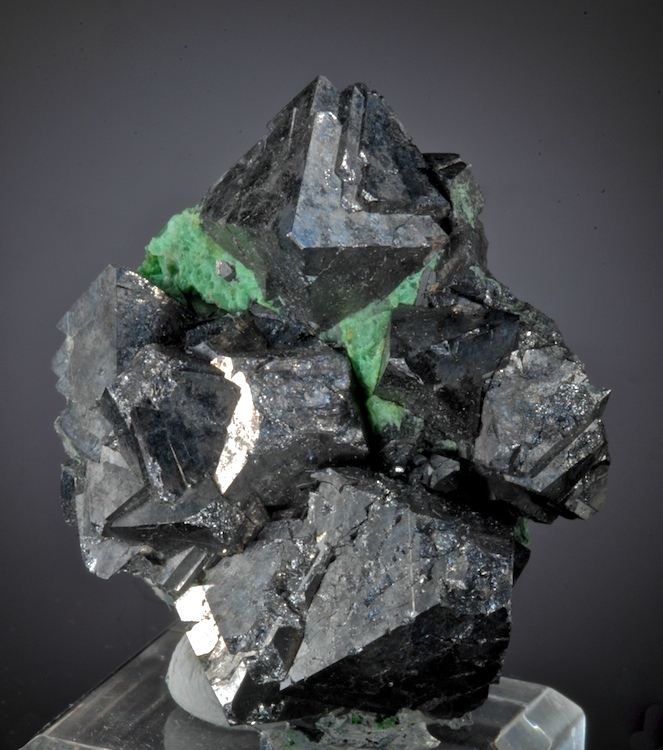 A superb Tarnowitzite cabinet specimen from Touissit that has no damage and great esthetics. The matrix is nearly all Tarnowitzite, with minor clear Cerussite and Galena. All the smaller crystals are perfectly transparent, the larger ones are typical milky and very sharp. Touissit has been closed for decades but for a short while it produced some of the worlds finest Plumbo- Aragonites rivaling the best from Tsumeb.This is an especia;lly choice specimen that displays well from all sides. Ex Charles Noll collection with several additional old labels included.